Is someone in your family a fan (or former-fan) of American Girl Dolls? Here’s an inspired idea- and a very worthy cause – I think you’ll want to hear about. 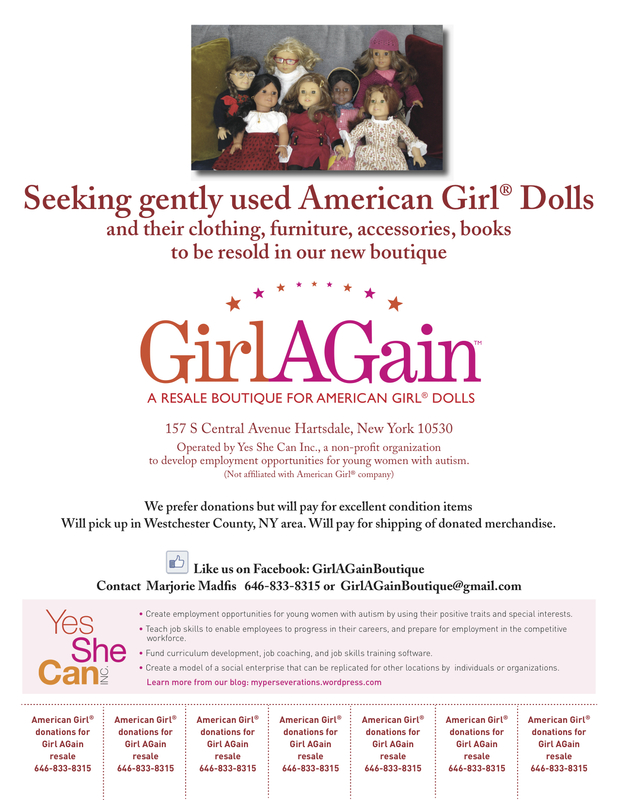 Girl Again boutique, now open in Hartsdale, is selling gently used American Girl items of every variety – dolls, clothing, accessories, furniture, and books. The not-for-profit store is operated by teens and young women on the autistic spectrum, and it offers the high-quality American Girl products that we all love at discounted prices. What a great idea! The store is the brainchild of Marjorie Madfis, a local Westchester MBA, marketing professional, and mom to a teenage girl with autism. Girl Again is a win on all fronts: a great resource for the all the girls and parents of Westchester wanting American Girl dolls and clothes at reasonable prices; a terrific way to repurpose the dolls and accessories possibly gathering dust in your attic or basement, for a worthy cause and a tax donation; and a wonderful way to help the employees of the store to gain real-world experience and training. The employees of the store are involved in all the many aspects of a retail operation, and the training, experience and confidence these women will gain while working in the shop will give them valuable and necessary life skills. The key to the store’s success will be a steady supply of gently used American Girl dolls, clothing, accessories, furniture, and books. This is where we can all help right now. Do you have any once-loved dolls who are ready to find a new home? American Girl books that your children have aged-out of? Assorted clothing? Do you know of anyone else who does? Please consider donating to this worthy cause. Donations will be accepted directly at the boutique, or you can email Marjorie, the store’s founder, to make other arrangements. This weekend, my family will be looking through our bookshelves and toy buckets to find American Girl items to donate. Won’t you join me in helping to get this wonderful organization off to a great start? Girl Again is located within the Sweet Heaven Spa at 157 South Central Avenue, Hartsdale, NY 10530 (just 1/4 mile south of Hartsdale Avenue across from Ethan Allan). Please visit soon to shop or drop off a donation. Phone # (646) 833-8315. Hours during the upcoming vacation week: 10am – 6pm. Like Girl Again on Facebook by following this link. Here’s the official flyer for more details, including contact information for Marjorie Madfis. ← Wonderful Westchester Wordless Wednesday: Where Is It?